Scroll down for a captioned slideshow depicting the construction and demolition. We here at the AMC campsite department work until a project is done. We don’t look at the workday as a nine to five day, if the weather is good we push into dark to reach a good end point to call it a day: one more piece of roof sheathing, one more shovel of compost, one more rock in (or out of) the ground. 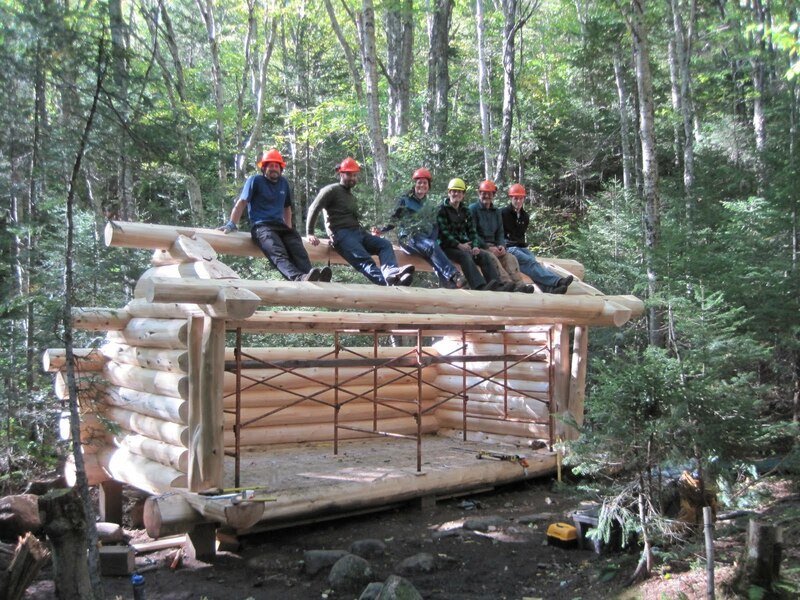 Due to this strong work ethic, it is no surprise that we were able to airlift, assemble, and roof the new Eliza Brook Shelter in two and a half days. A lot went into preparing for those two days. There were the years spent planning: where the shelter could be moved to within the site, what other things could be done to improve the site, and what kind of shelter should be built. Then there was the contract with John Nininger’s Wooden House Company, which is work of the heavily invested kind, from the day John walks out to mark his own timber to the final scribe of the gables and the squaring of the purlins. From our side at the AMC, we had Phase I and Phase II, the setting of the footings and then the building of the floor, two separate field weeks, two separate crews, two separate sets of tools. Last are the 11th hour logistics and unanswered questions for the final airlift on Monday September 20th: how many vehicles would we need at the airlift site? 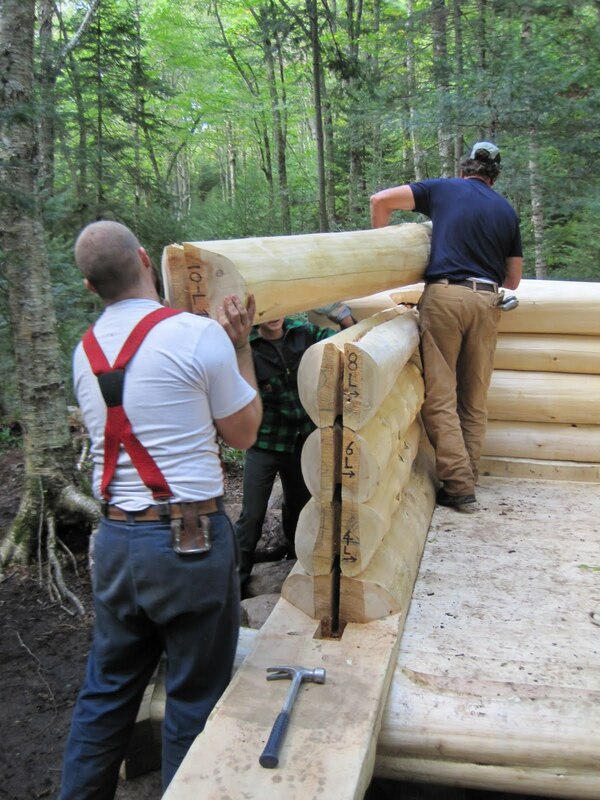 Would the Wooden House Company be able to pre-bundle the logs by weight so the ground crew could sling them easily? Would we be using a Bell 407 helicopter that can lift 1,800 pounds and carry six passengers or the Bell Jet Ranger that can lift 800 pounds and carry only four? Would the cedar we ordered for the fascia and rake trim arrive in time? Most of all, would the weather be good enough for flying on Monday? Many of those questions hinged on the answer to the last one. Monday September 20 dawned clear, cold, with an undercast. 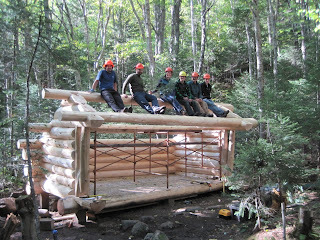 Our crew met at Pinkham Notch at 6:15 a.m., and headed over to Easton, NH where we would meet the ship. The fog started to clear as we arrived at the landing zone, sun striking the icethat had formed on the logs overnight. We arranged the vehicles, and began arranging loads. Soon the unmistakable whirr of the helicopter could be heard. It was time to go. 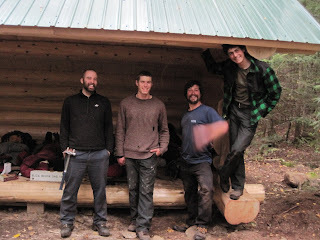 The six person crew that flew up was the crew that was going to stay and assemble the shelter: Mike Foster, Garrett Gorenski, Matthew Hickey, and Ryan Wilford from the AMC Backcountry Caretaker department, Sally Manikian AMC’s Backcountry Resource Conservation Manager, and Mark McCulloch, from the Wooden House Company who had built the structure with John Nininger. 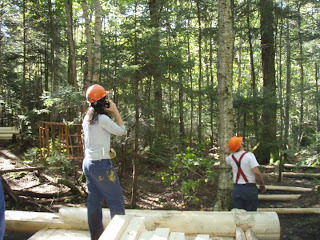 The crew of six was not a random number: we had heavy logs to move, but also didn’t want people standing around with their hands in their pockets. We hit the ground running, literally, after being dropped off by the helicopter nearly a mile from the campsite. What does 1,800 pounds look like coming through the tight canopy of trees? 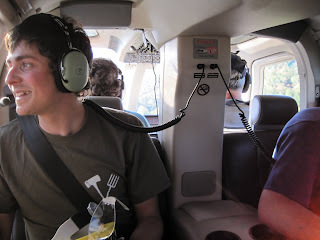 We had no idea, but we wanted to be prepared, with identifiable landing zones, good communication with the pilot, and everyone watching the trees above their heads from a safe distance. One person was on the radio, with two people designated as the load receivers. Between each load, we had 8-10 minutes, and this time was spent breaking apart the loads, relocating lumber to designated spots around the campsite, looping and retying the helicopter straps. Often by the time we were grabbing those final straps and reaching for the last few bundles of lumber, we could hear the rumble and whir of the helicopter again as it approached. The order in which the loads came in was critical. We didn’t want the largest logs clogging the landing zone. First came the loads that were easier to disperse, the sheathing, the roofing, the scaffolding, the personal gear and tools. Next came the smaller bundles of logs that we were able to break apart and move quickly, as most of the smaller logs weighed 50-100 pounds each. The airlift was over in less than an hour. 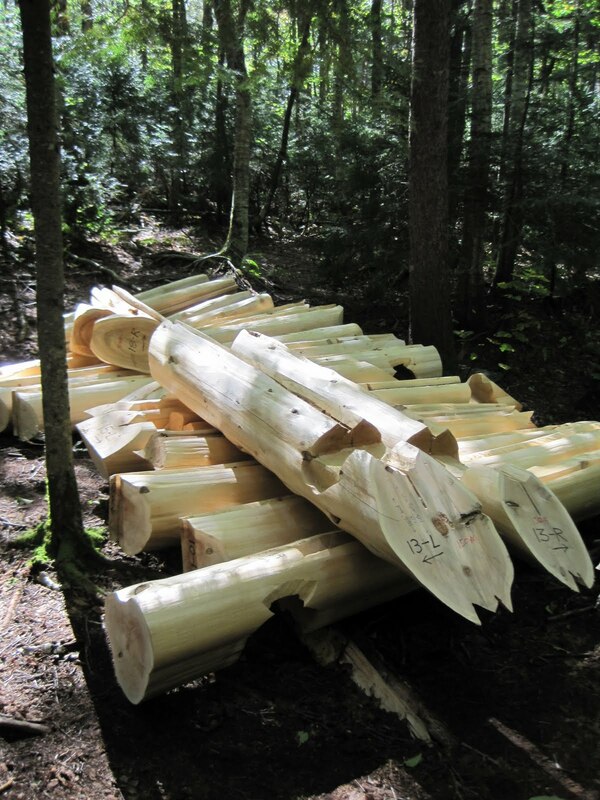 Eliza Brook campsite had turned into a lumber yard. And we had morphed into the building crew. The Wooden House Company has a specific numbering system, and with Eliza it was a simple straightforward one. Letters translated to directions: L for left, R for right, B for back. Numbers designated the order in which they were placed. It was simple because the structure was simple: three walls, one floor, no doors or windows. The trickiest maneuver came with setting firmly the two forked logs that support the front overhang, as the five foot logs fit into the notches in the end of every single side log. The logs flew together, and as the logs moved into the notches they suggested a living movement. 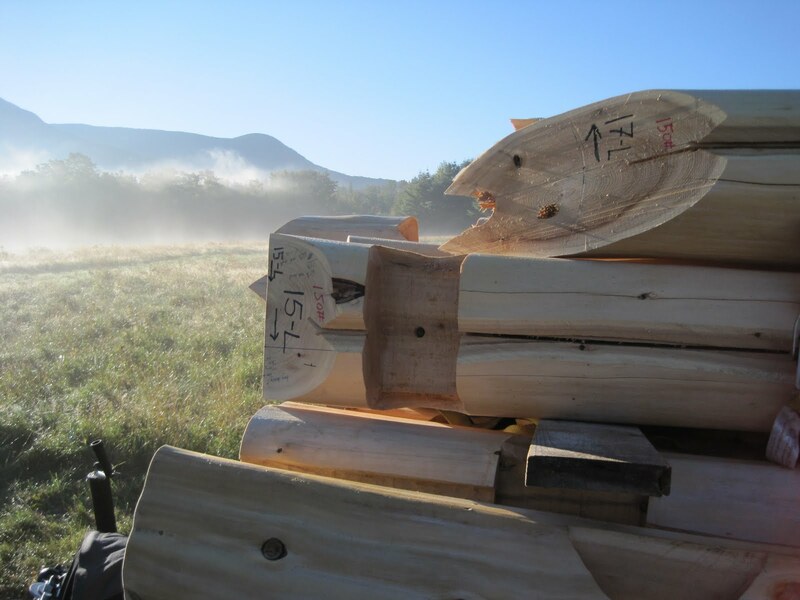 Cedar logs are solid stable static things, they don’t move to the eye. 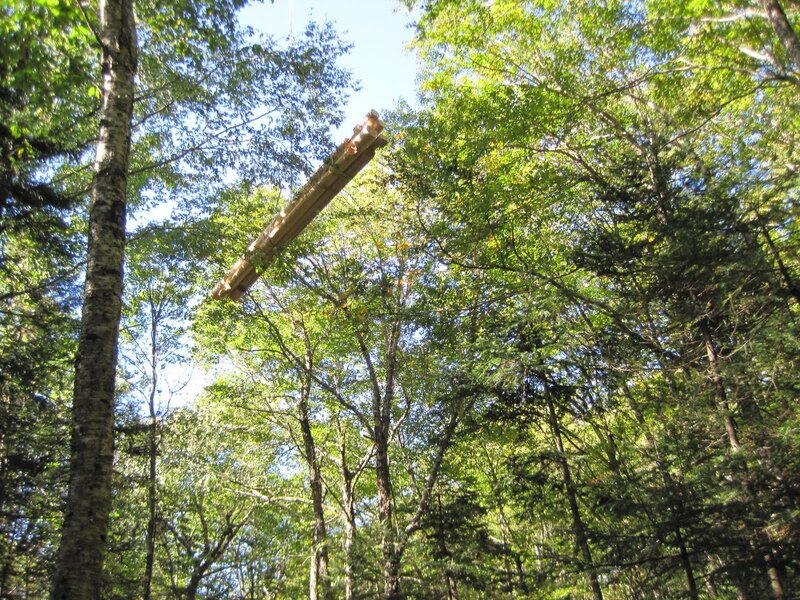 But watching the logs drop into their notches, it seemed like one would expand and breathe and receive the other, as it flexed into position. They curved in and out. And fit perfectly, a testament to John’s craftsmanship. By midafternoon on Monday, the structure was complete. 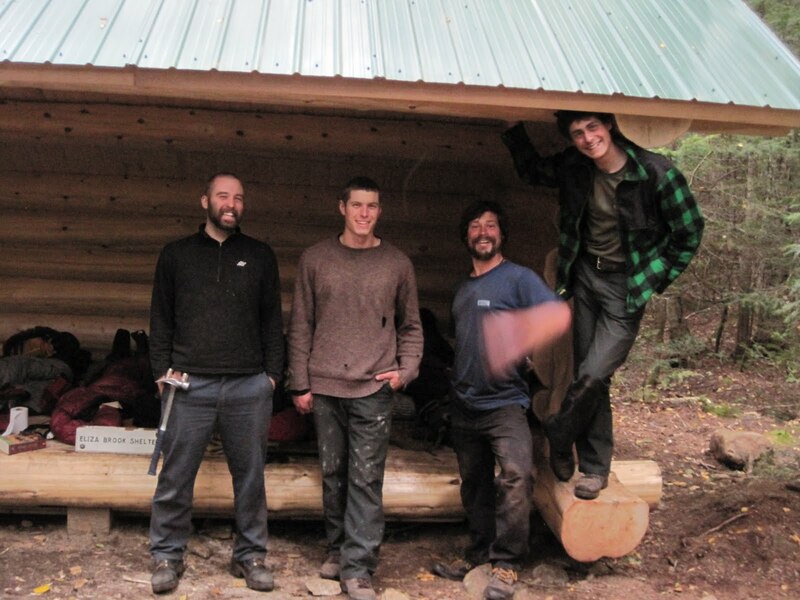 We had managed to haul the large ridgepole into place by hand, we had dropped and tightened the long threaded rods that would hold the structure in place (as well as tighten it up as the logs shrink over time), and we started assembling the roofing. The roofing needed to be affixed in a way that allowed fluidity: a roof that remained rigid would hold the gables rigid, and then create a gap between the gables and the lower wall, as the logs shrunk and settled. Mark insisted that a notch in every piece of sheathing was necessary, to promote movement and prevent gaps. With this one extra step, we knew we would be working into dark to get the roof on. Darkness falls at 7, and the crew hammered by headlamps until they had closed all the gaps in the roof. The shelter was livable, and after a brief pause to admire it by darkness, the crew quickly occupied it on this inaugural night. Day two was the day to finish the roofing, clean up the site, and demolish the old shelter. The old Eliza Brook shelter was built in 1963, of native logs assembled with spikes, with a tin roof. 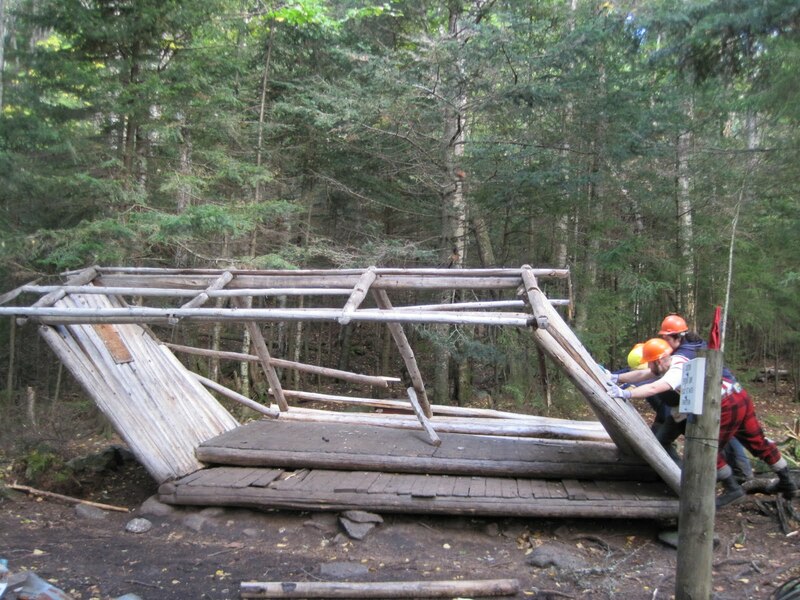 It was in an advanced stage of deterioration, and after removing the roof, loosening the back wall, the shelter was easily pushed over by the crew. 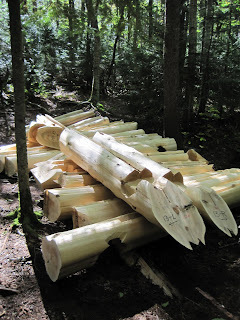 Then the painstaking work began of removing all hardware, all nails, spikes, thumbtacks, screws, and piling the native logs to be dispersed, one heavy packload after another, into the woods. The flooring, being pressure-treated, was bundled to be removed. Underneath the shelter? 52 pens. 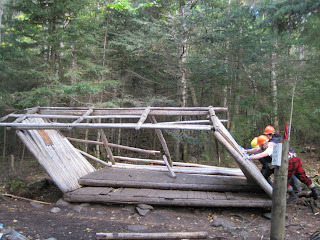 Wednesday, September 22, the shelter was finished and the old one was demolished. 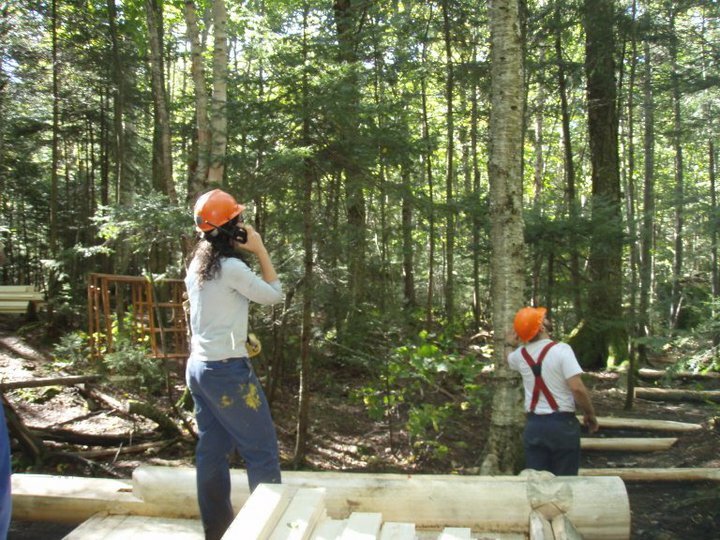 The crew then moved onto the further work that would occupy them for two more weeks: building tentpads, hardening the trails with rocks, and rehabilitating impacted areas with tree transplants. The shelter was done. The years of work, the seasons of preparation, and the last few 12 hour days made it possible. For more information on John’s Wooden House Company, check out his website. Want more? Enjoy these two slideshows (with captions) that capture the construction process of the new shelter and the demolition of the old one.